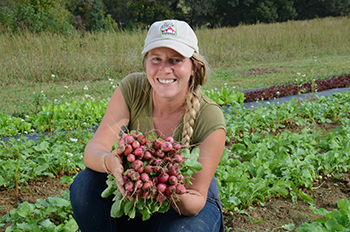 Join a Community Supported Agriculture (CSA) farm to plan healthy eating. Image courtesy of Pick Tennessee. NASHVILLE – Careful planning may be the key to reaching goals for healthier living. Research shows that people who tell others about their health goals with an official date to begin are more likely to succeed. Setting a start date provides time to anticipate and prepare for stumbling blocks. One smart way to plan healthy eating into your life is to join a Community Supported Agriculture farm, or CSA. In a CSA, a farmer contracts with other people in a community to provide them with a portion of the year’s harvest. CSA members pay the farmer before the produce season begins, allowing the farmer to buy seed, fertilizer and other inputs needed to grow crops. As produce ripens, the customer’s fresh, local food is already paid for. CSA members simply go to a farm or local farmers market to pick up their shares, or meet the farmer at a drop-off site in the community. February is American Heart Month. Joining a CSA can be part of a smart plan to change the way you relate to food. Having fresh produce in your refrigerator makes heart-healthy cooking and eating more likely. Many CSAs include recipes for whatever is in the box. Using local produce leads to eating seasonally, and many people discover they enjoy eating fruits and vegetables more when they are at their tasty best. Eating farm-direct veggies guarantees maximum nutritional content from every bite, providing an instant and effortless step toward a healthier lifestyle. Tennessee CSAs are accepting memberships now. Find nearby CSAs and farmers markets on the Pick TN mobile app and at PickTnProducts.org. Every CSA is different, so check out several to choose one that best meets your needs. Some CSAs provide only produce, while others include dairy products, eggs and even farm-direct meats. Pick Tennessee is the Tennessee Department of Agriculture service to connect farmers with consumers. Follow Pick Tennessee on social media for seasonal updates.